Tips for Hanging Art Correctly on your Wall! There is nothing more daunting than staring at a house full of blank walls & wondering how everything will come together! When you begin to think of hanging art it will relate to everything around in your room or space. Whether you hang a framed art or picture over a sofa, in the hall, or on a stairway wall, each of these spaces will have elements to consider! How high should it be mounted on the wall? How can it be arranged with other pieces to create an inspired statement? And, crucially, how can you be sure that it’s safe & secure & won’t end up crashing to the floor? If you are not sure how high to hang art on your walls, these tips offer useful ideas and designer’s secrets for getting the best look when hanging an artwork. As a general rule, hang the artwork so that the centre point of the piece or grouping is at approximately at the eye level. The location at which you hang art depends on the wall height, the position from which you view it & the artwork size. To view the gallery wall from a standing position, the optimal position for hanging a picture of art is at eye level. Place the artwork so that its centre is roughly in between 57 inches to 63 inches above the floor, since it depends on the height of the home’s occupants. In a room where you generally sit (like in the family room, dining room, etc. ), hanging a picture bit lower can be enjoyed at a lower viewing angle. You can evaluate the look by sitting on a chair, someone holding the picture against the wall, moving it up and down as per your convenience. Multiply your wall space (in inches) x 0.57. e.g. if your area is about 42 inches, i.e., 42 x 0.57 = 24 inch you want to look for art that’s 23-34 inches wide. Isn’t it easy, right? When you are hanging art by grouping various framed art work or objects on a wall, treat the cluster as a single piece, think of the grouping as one large picture & relate the bottom of the entire grouping to the furniture underneath it. When you are hanging art in a cluster, the grouping of artwork should be spaced in at-least 2″ to 3″ & not more than 6″. The same basic rule of thumb applies when hanging art work above the couch, television, fireplace, wainscoting or other architectural features. e.g. When you are hanging framed art work above the sofa, verify that its centre is at eye level & the entire artwork is centred over your couch! Art hung over a piece of furniture should not be wider than the width of the furniture, a general principle being that the art should be about 75% the width of the furniture. e.g. If you do a series of three or four frames art above a couch, verify they have the same amount of empty space on either side of the grouping and at least 2″ to 3″ inches between them. Hang the artwork approximately 6″ to 8″ inches above the back of the couch or 10″ to 12″ inches above a sofa table. You can also create a paper template of the artwork from newspaper & tape it at various locations on the wall to get a feel of how it looks. You can also cut out several templates when arranging a grouping to avoid to re-hang them until they look right. Align the bottoms & tops of several pieces of artwork along with a common line at eye level to create an appealing gallery wall. 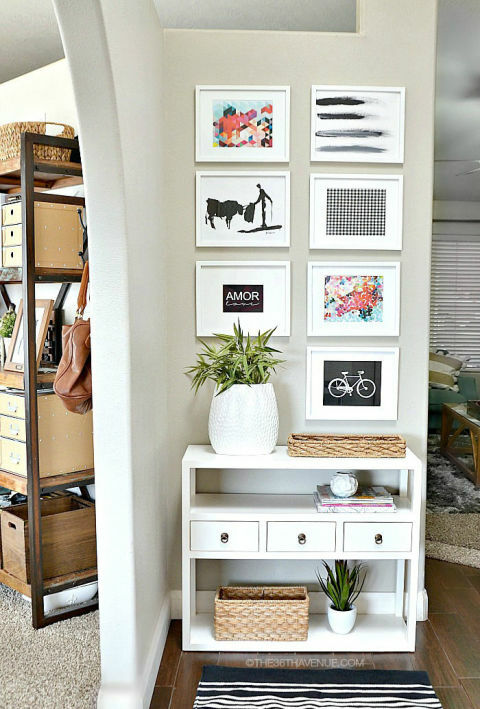 Move the template up and down to find the perfect spot before hanging a picture. You don’t have to place all your artwork at eye level, especially if you have a house with taller ceilings or double height wall. In this case, it may be better to think about placing the art such that the top one-third area of the picture is near eye level. While it defeats the purpose to hang artwork too high so that you have to crane your neck to see it, a large & open two-story great room presents an opportunity to add artwork higher than normal. This also makes the ceiling less far away. Tall walls offer an opportunity to add artwork of canvases that start much higher on the wall but end up at eye level. What about hanging small pictures? A small picture hung on a large wall would look out of balance. You should look for narrow walls (such as the spaces between the two doorways or windows) & consider hanging two or three small pictures in a vertical line. In this case, treat the centre artwork as the core of the grouping. When you are hanging art on a wall, choose hangers rated to handle the weight of the piece. Heavy wooden framed art hung on a simple nail, not secured to the stud in the wall, will eventually fall & may cause injury or damage. Try to use anchor bolts, toggle bolts or a cleat hanger to handle heavier pieces when you cannot secure the hanger directly into a stud. Next PostNext Floor Components: All You Like to Know!